What is the point of checking a site that provides assistance in writing academic works? The most important thing in this business is to show an ignorant person the most important points of the site, which are aimed at satisfying certain requirements. A first-time visitor can only guess about these requirements. So, we also provide an opportunity to review those aspects of the service that you did not even know about. We will tell you what it should look like and whether the site that we are considering today meets these requirements. Grademiners.com, hold on! The name of the site is really original. 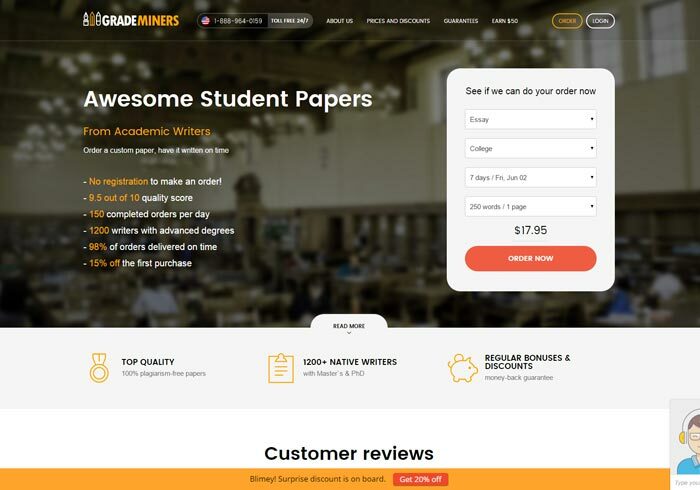 There is such an interesting feature as video reviews of customers – quite a rare phenomenon among sites offering their assistance in crafting academic papers. However, from the functional point of view, this is superfluous: the video may not be loaded, the site may hang. It would be enough to provide some textual information with the indication of the discipline, the total size of the work, the period of its completion. It would be informative and would not make the website too heavy. You can agree only with the third point. Communication with the author as well as custom support cannot be paid services, so placing them in the free features section is irrational. The on-time delivery, in general, is not worth being considered – it is the duty of every writing service team that respect themselves and their clients. The site provides an opportunity to earn money, becoming their advertising agent, roughly speaking. To do this, you need to share a link to the site with your friends and have a certain amount of money on your PayPal account. From the standpoint of advertising and attracting customers – it is a great idea. This is a kind of psychological game on one of the main student needs – the need for money, so it is a win-win. There is nothing difficult in sharing a link. However, other questions may arise here. For what is this measure taken? It looks more like the initial promotion of a new company, which no one knows about and that needs advertising. When the company has already gained reputation, there is no need to attract customers with additional measures, as they already know about its strengths and are returning for the quality. In general: the site clearly lacks clients and has some flaws which they are trying to fill with additional services, which just distract you from its essence.